President Donald Trump pushed back against criticism that changes to the senior leadership at the Department of Homeland Security are part of a systemic purge to enable the president to pursue a tougher immigration policy at the southern border. With reports swirling that the administration will accelerate deportations, Trump said he is not looking to resume a zero-tolerance child separation policy – an approach he blamed President Barack Obama for instituting. While it’s true that child separations occurred during the Obama administration, such as when there was suspicion of human trafficking, there was not a systematic policy that resulted in widespread separations. After taking office, Trump and former Attorney General Jeff Sessions implemented a "zero tolerance" practice before eventually ending it amid widespread public outcry. Trump appeared to suggest that the zero-tolerance policy served as a strong deterrent to families crossing the border illegally. Border officers stopped more than 103,000 undocumented migrants attempting to cross the southern border in March, the majority of which were families and unaccompanied children surrendering to agents after crossing illegally. Newly released data by Customs and Border Protection, which confirms record-setting projections, indicates another sharp increase of migrants attempting to cross in recent months. The total number of migrants stopped in February was roughly 76,000, and about 58,000 were stopped in January. More than 11,000 families have been released since the agency started the practice last month, according to the agency, while hundreds of agents processing legal travelers at ports of entry have been reassigned to assist border patrol in managing the migrant flows causing backups and delays for legal travelers. After Trump forced out several senior officials from the top ranks at the Department of Homeland Security in recent days, House Democrats said that the president’s decisions amount to a “purge” – warning that the country’s security is undermined by a lack of leadership experience atop the department -- with additional departures expected in the coming days. 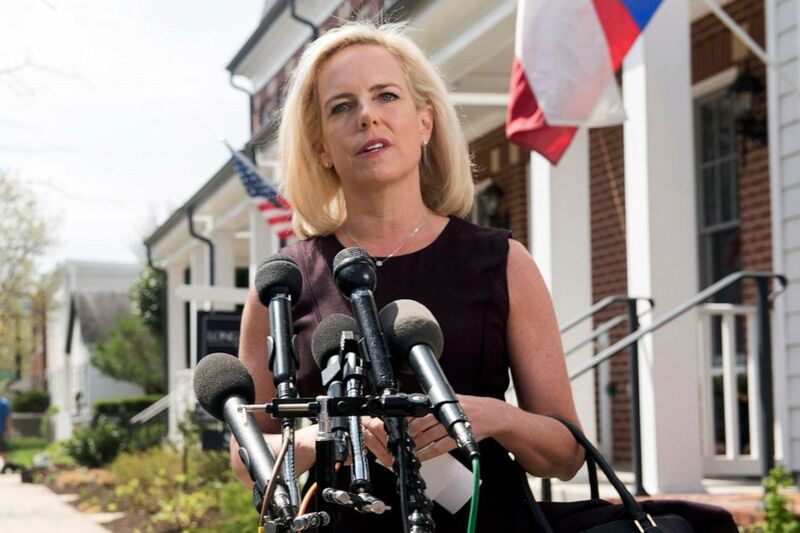 Homeland Security Secretary Kirstjen Nielsen talks outside her home in Alexandria, Va., April 8, 2019. “I am enormously disturbed about the instability of the front lines of securing this nation,” Jackson Lee, D-Texas, said. “It is very disheartening and it’s scary to watch how the president is basically dismantling the Department of Homeland Security because he cannot get his way,” echoed Rep. Val Demings, a Florida Democrat who also serves on the House Committee on Homeland Security. Homeland Security Secretary Kirstjen Nielsen resigned Sunday evening, before Trump pushed aside Secret Service Director Randolph Alles on Monday. Additional departures are expected in the coming days. Two other top DHS officials, U.S. Citizenship and Immigration Services Director Francis Cissna and Office of the General Counsel’s John Mitnick are also expected to depart soon, according to one official -- raising the prospect of a much broader cleaning of house among the Homeland Security leadership ranks. "By the end of the week, more than half of the department’s agency heads could be gone with the positions vacant or with acting [personnel]," one senior administration official told ABC News. Rep. Nanette Barragan another member of Homeland Security committee, said she is also “concerned about the rhetoric from the president wanting somebody tougher” amid reports that Trump wants to reinstate the zero tolerance policy. Senior Advisor Stephen Miller attends a Cabinet meeting in the Cabinet Room of the White House in Washington, DC, Aug. 16, 2018. 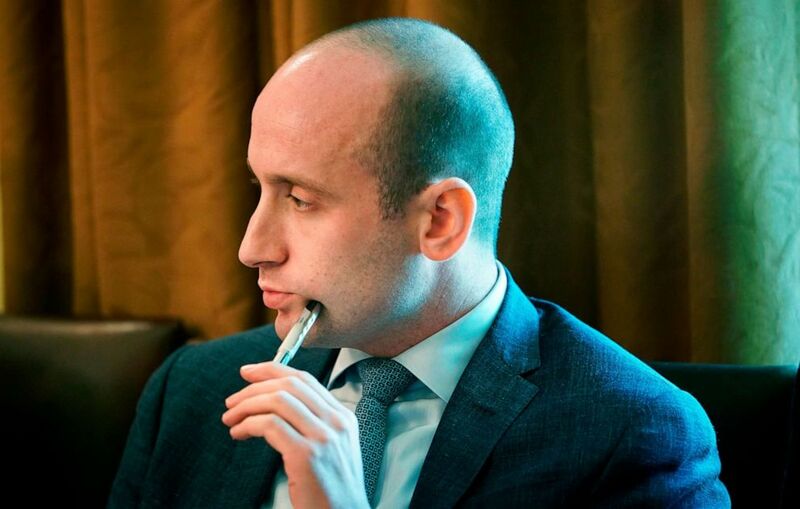 Rep. Pete Aguilar said Trump “needs people who will follow the law” – aiming his criticism at White House senior advisor Stephen Miller, a hardline conservative perceived to have the president’s ear on immigration policy. House Majority Leader Steny Hoyer, who has served in Congress for 20 terms alongside six presidents, called the Trump administration “the most unstable” presidency he could remember. "I think this is a dangerous phenomena to have so much turnover," Hoyer said. "I don't know that I can remember any administration's that’s had this big turnover and fired people in the extraordinary fashion with which he's fired people, which has got to intimidate anybody within the administration from coming forward with honest advice based upon the facts as they know them and believe they are."